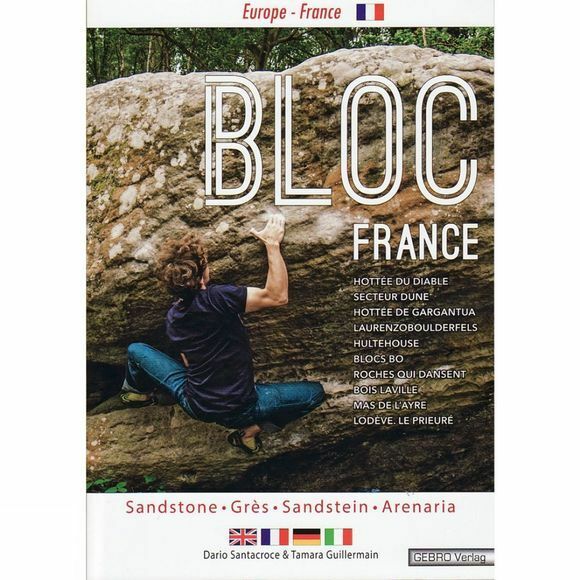 This guidebook covers some of the lesser well-known sandstone bouldering areas in France that will appeal to climbers looking for different bouldering areas in France away from Fontainebleau. Four distinct areas are covered, which are; around Reims in northern France; the Alsace region near Strasbourg; along the Rhone valley to the south of Lyon; and around Montpellier. • Reims area; Hottee du Diable, Secteur Dune, and Hottee de Gargantua. • Alsace region near Strasbourg; Laurenzoboulderfels, and Hultehouse. • To the south of Lyon; Blocs Bo, Roche qui dansent, Bois Laville, and Mas de l'Ayre. • Around Montpellier is Le Prieure. The guidebook describes around 1,100 problems from Font grade 2 to 8b, which are all shown on colour photo topos, and on boulder maps. At the start of each bouldering area there is a good location map and detailed access information, along with GPS coordinates for the parking areas. English and other languages.